I felt, and still do to a point, as though I was slowly being buried. And each good thing that brings me joy was like a gasp of air, but each gasp seemed shorter and shorter, and provided less air for less time. Eventually I was buried under. Nothing meant anything, even my life. Even my life. My mind is my favorite organ. And it just could not work. I started being more flighty than usual, then forgetting dates in history, people’s names, what day it was, what time it was. I began losing things, too. And I don’t lose things! I just don’t. So when I do, I feel like I’m losing my mind, and I — tentatively using the past-tense — was. I had days lost in bed in silence. I didn’t want any sound or light, just to fall back to sleep. I was staying in my pajamas, not showering. And I simply could not handle anything anyone else said, or communicated in any fashion. There was no room or ability to pay attention, or listen, or just have others’ thoughts in my head. I didn’t even eat. I considered entering inpatient psychiatric care. I got this bad for many reasons, some of which I can control, and others that are completely out of my sphere. And part of it that I could fix came down to my therapist. She has been absent since just before Labor Day, and she was helping me with some difficult issues. But after some naturing over the weekend with friends, and a desperate visit to my psychiatrist, I was finally given a new therapist. And she’s great. She has an extremely positive vibe, but manages to not be punchable because of her tremendous empathy and inner beauty. So, I’ve climbed off the literal and figurative ledge for now. But it’s not as though I’m raring to freakin’ go this week. Poco a poco. I still feel the need to constantly excuse myself to my family and loved ones for asking for anything. I fear over-taxing them and that my crazy is contagious. But I’ve found all the people that truly love me are happy to help me be happy. And I want more than anything for them to feel good too. To accomplish this, I took the unprecedented step of looking for good things in my life. And stuff I enjoy. It began with my dog, Abbey, the go-go Border Collie who keeps me outside and moving despite the weather or how I’m feeling. She also gives excellent morning cuddles. And then there’s Mr. Puddems, my fancy kitten man, who is a world-class lap-warmer. The Stan-man, of course. Our home. And going to friends’ houses. And golly-gee but I started taking showers, dressing nicely, dressing in general. Coloring, and I even started an oil-sketch. Gosh darnnit, I even cooked and cleaned in the same day. I honestly have to stop all this or people might get the idea that I’m a capable human being, and like *gasp* expect stuff from me. I may have to go to family meals! They may expect me to be on time! But, let’s not get ahead of ourselves here. I’m back to taking a lot of emotional strength and capacity to live and love from Mozzy and The Smiths. Some folks might mistake this as indulging in depression. But it’s not so. Morrissey is just on my level. All the right amounts of passion, aggression, gentleness, strength, weakness, frustration, and joy however fleeting, just suits me fine. And keeps me going. He still is. So, everyone just deal with my love of Morrissey. It’s difficult, I know, but I’m not going to desert the music that’s gotten me through my teenage years, and through many troubles in between then and now. I’m more sorry about asking others’ to accept this than for most anything else. And then there’s this blog. I started it over a week ago. And I’ve written maybe a paragraph or two a day. I used to be able to do these in one afternoon. But it’s been rough to communicate at all, nevermind attempting to explain these feelings to others. I feel extremely vulnerable, and of course sorry for anyone reading this, and sorry for perhaps upsetting them. Some habits are harder to break or reinstate. But, hey, at least I can write this much again. I’m a white girl from a good family, I have a college education, I have a life and loved ones, and I’ve been in treatment for mental illness since I was nineteen. I’m lucky. But everytime I see a homeless person, hear of a suicide, see someone lost to drugs or alcohol, or working on a non-violent criminal record, I think: There but for the Grace of the Force go I. The rest of us who live with mental illness don’t get the same press or privilege. Whether we deal with abuse, genetic predisposition, addiction, or life experience — and it’s usually a complex of some or all — mental illness is a lonely slog. For families with mental illness and/or dysfunction — again, usually both — the family generally falls into camps. The “get over it and move ons” and the silent and suffering. And those camps often overlap. But the punishment for breaking silence can be severe for those brave enough to admit there is a problem. Although I have found that adopting an attitude of “Yep. I’m cray-cray. But I’m not hurting anyone. So deal with it.” has been helpful to me, it took me two decades of continuous treatment to get to that point. It is liberating, but even so, telling someone you have a specific mental illness, doesn’t mean suddenly they will “get you.” It certainly won’t help in a job interview. Depression or Anxiety may be abstract ideas that exist in people’s heads, but when you behave like a person who suffers from those disorders, few understand. While informing friends and family that you have cancer is a thing my father could not even do, cancer is something that people understand will come with a certain set of painful difficulties. They will often research it to see what to expect. Doesn’t work that way with mental illness. If you tell a family member or loved one, “I suffer from mood disorders,” you might as well have said, “Hey, I’ve gotten really into day trading.” Their eyes kind of glaze over, and they sure as hell aren’t going to Google “what is day trading?” Or, “what to expect when a loved one is day trading?” But get ready to witness all manner and degree of expressions of shock, dismay, anger, and shame when you behave like someone with a mood disorder. Or when your needs and/or limitations get in the way of their life and plans. That’s why the most common thing a mentally ill person says is “I’m fine.” Especially if we’re not. When most people think of mental illness these days, they think of school or church shooters. Violent killers, all of them “mentally disturbed.” But, even among schizophrenics, violence and mental illness don’t go hand in hand. I have to watch idly by as people discuss forcibly registering people as mentally ill who want to purchase a shotgun for their home. That’s two Constitutional rights, if you’re counting. (The Fourth Amendment Right to Privacy is the other one.) “Mentally ill” is a stigma, and a silencer. If I went to Senator Pat “I don’t ever listen to my phone messages” Toomey’s office to protest, all you would see is a white girl with a sign and an attitude. And if I were hauled off by the police, you’d probably think “Crazy chick!” You can’t see by looking at me that I have serious health problems. I “present well.” I appear “normal” and “fine.” But if you did discover you were right about me being crazy, you could discount my opinion completely, right? And I have been told too many times to not even follow the news. Apparently, I cannot even handle being informed on issues that affect me. The mentally ill have no political voice or capital. No one is courting our votes. Should crazy people even be allowed to vote anyhow? We are not only socially marginalized and stigmatized, we have no say in policy or our care, if we can get it. Do you know what the wait times are to begin treatment if you have Medicaid? At least a month. That goes for drug and alcohol, and dual diagnosis treatment as well. And if you have private insurance, how many therapy sessions does it cover? Can you fit therapy into your work schedule? Do your medications impact your ability to work? How many hours in six months before therapy starts coming out of your pocket? What about the prescriptions? Do you just go to your family doctor and get some random “happy pill”? Get sent on your way with no therapy or guidance? Do you know what the side effects may be? Do you understand how to take it? Most importantly: can you afford it? Most importantly though, when it comes to it, doesn’t it just make more sense to at least make sure that those who suffer from mental illness receive care and treatment to ease their suffering? Nevermind free those who are treatable to live productive and even happy, “normal” lives? Ease suffering, make more functioning citizens? Am I making any sense? More sense than the latest Tweet or speech by President Trump? Or do I sound crazy? If only I had money. In the striped Light of the Sun. Light was once Blue. That I am one of the last who remember The Blue Lights pushes me to preserve the memory of that time. The time before now, when the Blue Light reigned and wisdom slept. For it was in this time that I encountered the True Light. Through the woman who lead me through the Dark of the True Light after the Blue. NICOLE. Who’s lack of Blue and strength in the True made her the embodiment of the True, and hers the Path through Blue to True. Who LAUGHED and saved my life. Nicole first acknowledged me with a LAUGH. As well she should, and I deserved, having LOUDLY CURSED a sudden yet inevitable betrayal, as my easy-up tent fell about my head, capturing me within its silky, billowing folds of white and blue nylon. How apt my predicament! How her blonde hair shone as I emerged blinking into the True Light, from my encasing in the False and Blue. Nicole rightly accused me of plagiarizing a line from an ill-starred fiction of the Blue Times, which had treated with the subject of the fire of flies. I was unconscious of the significance of the moment. But she had seen into my soul, and perhaps she saw the SPARK of the True Light in my eyes, so long darkened by the Blue. So many fictions, so many earnest reports, so many thumbs, so many narratives, as of the fire of flies, the trekking of stars, and WES ANDERSON. Worst of all, my own creations on the Screens of Blue. I felt ashamed. And then I saw! A drunken camper nearby had started a fight! A man was bleeding and protecting a young woman, the object of a love triangle, I supposed. The camp manager subdued the drunken man with skillful and minimal force. Truly his Kung Fu was on point. Soon police arrived and arrested the drunken man. I had seen this without the Blue Light! I immediately suspected that Nicole had called this scene forth from the True Light, so that I could see. And I LAUGHED! Just as she had done to me. Truly, life in the True Light was more true than anything called from the Blue! And this Nicole showed to me. And so it was for many month’s passing. I would pitch my tent by Nicole and her consort, and I would see wonders! For they would MAKE MUSIC ISSUE from stringed instruments and from their mouths, and not from the Blue Lights, not even Spotify. Soon we learned to MAKE LAUGHTER from the True together. We fished often, and while I never saw her catch one, I knew she only waited for the Truest and most tremendous of fish. She left me the others to encourage my learning the Path of the True. When forced indoors, she would visit me to encourage the making of art. And REMINDED ME WITHOUT WORD that one should set out the food one makes for visitors, and other gentle arts of the True Light world. But just as I began to see and value the True Light through her, the Blue Lights came between us. We SPOKE ONLY IN SILENCE through the blue blurbs on the Blue Screens. The True had forsaken the world, and there was a GREAT NOISE of ORANGE, and then the Blue Lights went out. We will never know why because the Blue was suddenly gone. No screen lit our faces and nights, and the only light of day was the sun; and of the night, the moon and the trekking stars, and the fire of flies. But no Wes Anderson. Plunged into the Light of the True, however dark it may be, my one hope for Salvation lie in Nicole, in the living of the True Light and the Path. Her consort, JOE, was cool too. And so my life in Truth began, with my consort (STAN, who was handy and cool too) and my loyal friend, the canine ABBESS OF ROADS. So begins the tale of my struggle, survival and eventual mastery of the world of the True Light, by the Grace of the one named Nicole. Who LAUGHED and saved my life. This is just all kinds of wrong. Let’s get something straight. Women’s Day is not Valentine’s mixed with Mother’s Day. Although there are many competing claims for the first Women’s Day, including Suffragette, Socialist and Workers strikes by women in the US and Europe, the best claim goes to the women of Russia. By the Russian calendar, on March 8th, 1917, female textile workers stormed the streets of Petrograd (St. Petersburg) demanding bread, protesting Russian engagement in WWI, and demanding the end of Romanov imperial rule. A week later, the Russian emperor abdicated, and women were granted the right to vote by the interim government. The date was proclaimed a working holiday in Russia that year, but was declared a full national holiday in 1958. In 1975, it was recognized as an international holiday by the UN. The point of this little history lesson? That Women’s Day celebrates the power of women to bring about revolutionary change. Not how pretty or cute or sweet we are. It is a revolutionary holiday. In essence, it’s a day to acknowledge the power of women to effect change in the world. And I never even knew about it until I was in college. I switched my major to Film midway through my Freshman year. And of my almost completely male new department, one man became my first friend. Let’s call him Max. Max is from a republic in the former USSR. He had served in the Red Army, and his father was a Party member. Max got to come to the US with refugee status, and became a citizen while teaching himself English from the TV. Eventually, he pursued his dream of studying film, and there we landed together: two strangers in an exclusive club of upper-middle class white males. Max was the first person to wish me a happy Women’s Day. I had to ask him what it was. Because, even though many nations celebrated the day, The Land of the Free did not. And it’s the revolutionary (and Soviet) origins of the holiday that America has feared most. Because while the Soviets were sending the first woman into space in 1963. Back in the USSA, only married women could be prescribed The Pill by an (obviously male) doctor’s discretion, and back-alley abortions were claiming women’s lives. Meanwhile the Soviets had female doctors. Maybe it’s the historical nature of female experience that causes this revolutionary fervor. After all, it was the working women of Paris who marched to Versailles in 1789 to demand bread, and who returned to Paris with King Louis and Marie Antoinette in tow, kickstarting the fall of the repressive Ancien Régime. Women often hold multiple jobs: lover, wife, companion, caretaker, mother, chef, cleaning lady — usually while holding down paying jobs. We are taught to care for everyone but ourselves. We apologize for doing things a man would never think of being apologetic for: talking on the phone, spending money on things we want or need, playing our favorite video game. But let’s face it, how long can any person truly live this way? Sure we care about war because our loved ones and innocents could die, obviously bread because we don’t want to see our family starve, we care about oppressed groups because we get it. But we also want those freedoms and the equality that we help others achieve for ourselves. Sorry! We want to control our reproduction because that is the key for us to have the freedom of men. We can go to college, have a career, and a family we can afford to care for. Or not! This is never a question when it’s a man’s choice. We get to have that choice as human beings, too. Our value is more than what our uteruses can do. By demonizing and depicting women without children, or unpartnered, or with a career as sad, unattractive (read “overweight”), and lonely; we devalue the women who have made those choices. And it just so happens to be a great way to direct female anger and frustrations at women who made different life choices from the actual cause of their pain (whether it be abuse or simply frustrated dreams) onto other women. It’s splitting. And American culture is great at it. Women’s Day is a revolutionary day. A day to unite. We are the most historically oppressed class of humanity since the Bronze Age. And yet, here we are. Patient Penelopes enduring when we must, and fighting when we can. Usually at wit’s end. So don’t give me flowers for Women’s Day. Give me equal pay for equal work. Give me coverage for my health needs, and access to safe and legal family planning. Give me the right to post pics of myself on social media without being stalked. Give me the right to wear a tank top when it’s 90 degrees without feeling gross and ogled. Give me the right to say “No.” Give me the right to leave an abusive partner. Give me the right to report my boss or colleague for inappropriate behavior. Give me equal representation in government. Give me the rights that men enjoy without a second thought: my human rights. *Please check out this list of nations from those with the most equal representation of women in government to the least. Rwanda is tops. See if you can spot the USA. So many backgrounds! Just an American! What makes an American? What’s the recipe? Well, unless you are purely Native American, the recipe includes immigrants, slaves, and refugees. Whether they came of their own accord, or were forced here in chains or shipping containers, your family came to the Americas from somewhere else. So I thought I’d share the recipe of me. This is me according to my DNA. So this is where I’m from according to a blood test through ancestry.com . But the story is much better than this map. And this map doesn’t even include all my ancestors, my mother’s looks different! And my sister’s shows much more Eastern Mediterranean! So, that’s the science. Here is the story. We’re not sure! There were adoptions on my Great-Grandmother’s side. But they were Presbyterians and had red hair. So let’s say, Scotch-Irish. Along with the Welsh, the Scotch-Irish immigrants came pretty early on, usually as indentured servants or victims of the terrible resettlement policies of England from Scotland to Northern Ireland. The Scotch-Irish were some of the first pioneers in the “Westward Expansion” … to the Appalachians and beyond! My Great-Grandma Miller came from Kentucky, honey! Well, the Millers have been in Lancaster County, Pennsylvania since the War for Independence. Story is, he was a German mercenary fighting for the British. After the war, he settled in the already German-speaking county with it’s large population of Mennonites who fled religious persecution in the German states. He married one of those Mennonites, and now there is Millersville University (on their donated land)! The amazing thing is why the Mennonites were here in the first place! Pennsylvania’s founder, William Penn, was a religious dissenter in England. He did time in The Tower of London for writing Quaker pamphlets with charming titles such as, “No Cross, No Crown.” He famously declared religious freedom in his colony, stating in his Charter, “We cannot make windows into men’s souls.” Which is why the first Jews in the Americas lived in Philadelphia, and why it’s home to the oldest Catholic Church in English-speaking North America. So, when the Mennonites fled Germany, PA was the only colony they could settle in. My maternal-grandfather was the son of Hungarian immigrants, who fled Europe when the Austro-Hungarian Empire landed on the losing side of WWI. And, apparently, people from Hungary identify as Magyars, a horse-archer people from the Steppes who took that land in the early middle ages. It was Latin writers who called them Huns! Even the women served during WWII in this family! But obviously we’re concerned with Mary Miller and Joe Sirbak. Because they made my Mom. Mom. Eating a sandwich while striking management and a pose! Yeppers, so that’s how you make this lady. This woman who left her hometown in Lancaster to move to Philadelphia, to work as a social worker in the blighted area of Front and York Street. She was also shop steward for her union at her welfare office. Yes, I get my bleeding liberal heart from her and that whole nutty family! So that’s the maternal side of my family. Let’s go back to the tumult of WWI, and the Italians and Greeks who fled here, and check out my Dad’s side. 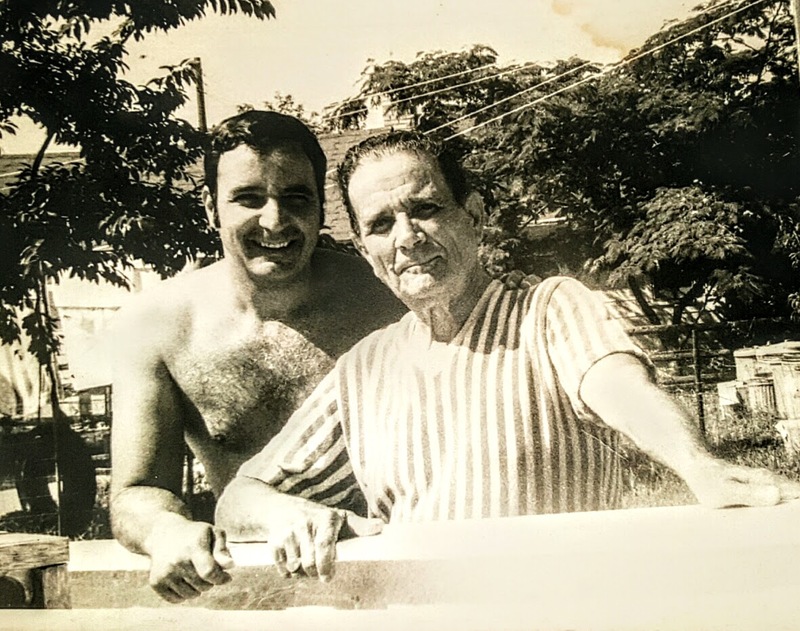 Here is my Dad with his, my Grandpop Lakis, “down the shore” of course! “Interesting” is barely enough to describe my paternal-grandfather’s story. He was born on the island of Khios, just off the coast of modern Turkey. He spent his days collecting olives and lemons. But he also collected salt from a rock that was exposed at low-tide. Story has it that he had to fight an octopus once on that rock with his knife. He killed it, and his family had it for dinner! But he also grew up under the rule of the Ottoman Turks. As a young man of 16 or so, a Turkish soldier raped a local girl, and my Grandpop killed that soldier. He had to be disguised as a girl by monks, and secreted off the island on a merchant ship. Well, that ship was torpedoed. So he was picked up by an American ship, which was torpedoed. Whereupon, another American ship picked him up and docked in New York. He decided to stay. He helped paint the Benjamin Franklin Bridge in Philadelphia, but he gambled and was owed money by a sometime concrete contractor and bootlegger named Frank Gigliotti. Frank was a recent Italian immigrant. But his wife, Asunta Camarotta, had returned to Italy. She took all their children, but Frank made her leave their daughter Anna, my Grandmom, as proof that she’d return. My Grandmom Lakis never saw her mother or siblings again. Apparently, her father hid the letters her mother wrote to her. And he exchanged her to fix a gambling debt, while Grandpop Lakis got his Green Card and became a citizen. Grandmom had that kindness that is strong from much perseverance and personal pain. But even though their marriage was arranged, they were prolific. And Grandpop Lakis eventually owned his own diner — of course — first in Philadelphia, and then in Wildwood, New Jersey. Enter my Father. He’s that cool guy with the jelly-roll hair and zoot suit above in the upper right. While my Dad’s older brother Mike joined the Navy in WWII, my Dad ended up drafted into the Korean War. Well, not much left but for this handsome man to go to college on the GI Bill, become a successful freelance artist, and meet that blonde, bleeding heart liberal gal on a blind date at Dirty Frank’s Bar in Philly! And the rest is my story! It was a weird and messy road to me. Mercenaries and persecuted religions. Central Asian horse-archers in Easten Europe, who lost WWI and ended up as refugees. Killing octopi and Turkish soldiers! Escape. Backroom gambling. Bootlegging. A real-life, immigrant tear-jerker worthy of Puccini. Criminal dealing for Green Cards. Hey, it’s all good. It’s All-American, like me. What’s your “American Story”? What recipe of immigrants and survivors makes you 100% American? While you’re there: check out my (Polish, German, English, Irish, Welsh) BFF’s Instagram and share some love.